2 Metabolism Metabolism is the totality of an organisms chemical reactions: Includes all processes that involve breaking down energy sources Ex. cellular respiration, digestion, etc. Arises from interactions between molecules and cellular environments. Is concerned with managing the material and energy resources of the cell. 3 Metabolic Pathways Are intricate and numerous. Utilize steps to minimize loss of energy (most efficient paths are used). Are selectively accelerated by presence of enzymes (biological catalysts). 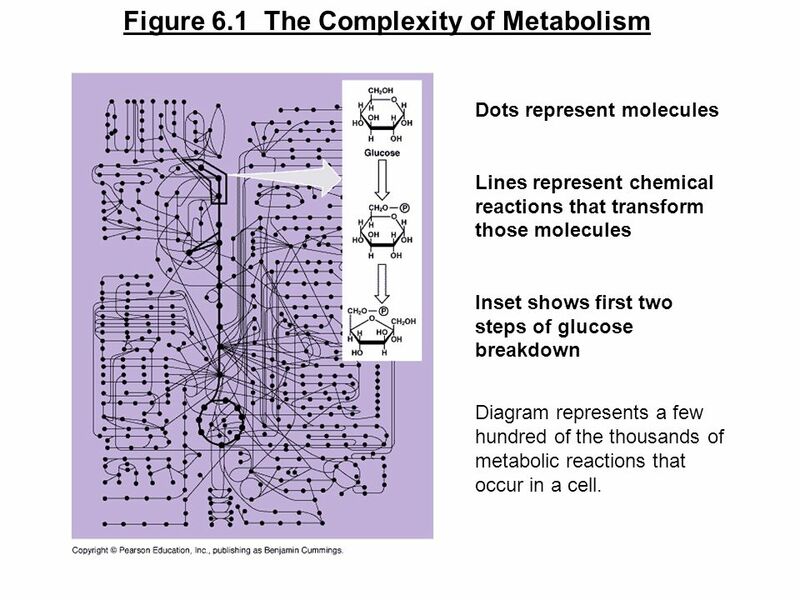 Dots represent molecules Lines represent chemical reactions that transform those molecules Inset shows first two steps of glucose breakdown Diagram represents a few hundred of the thousands of metabolic reactions that occur in a cell. Defined as capacity to do work (move matter against opposing forces). Exists in a variety of forms, and work of life depends on ability of cells to transform energy from one type into another. 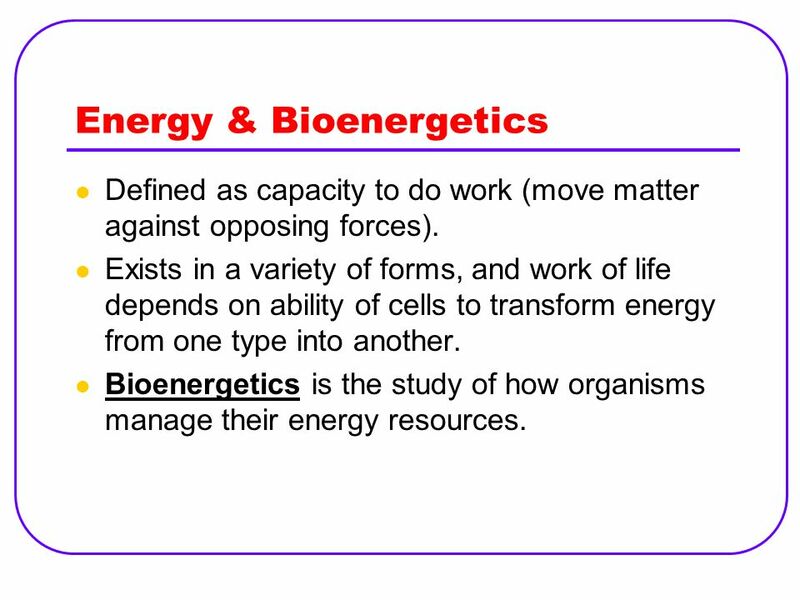 Bioenergetics is the study of how organisms manage their energy resources. Potential Energy: stored energy that matter possesses because of its location or structure Ex. 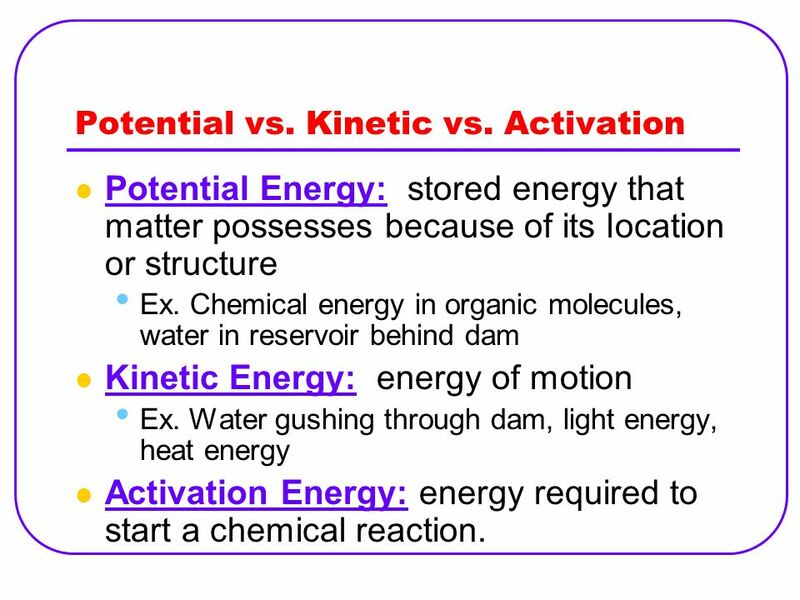 Chemical energy in organic molecules, water in reservoir behind dam Kinetic Energy: energy of motion Ex. 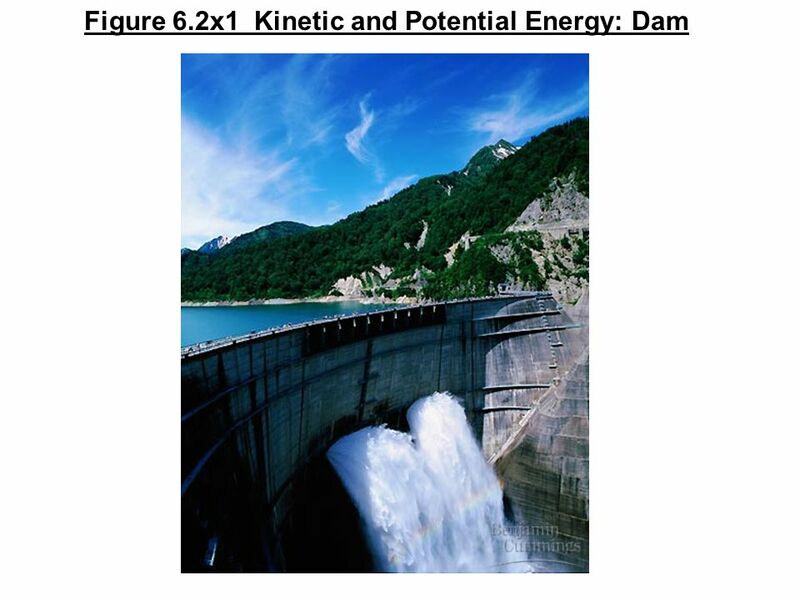 Water gushing through dam, light energy, heat energy Activation Energy: energy required to start a chemical reaction. Energy can be transferred and transformed, but it cannot be created or destroyed. 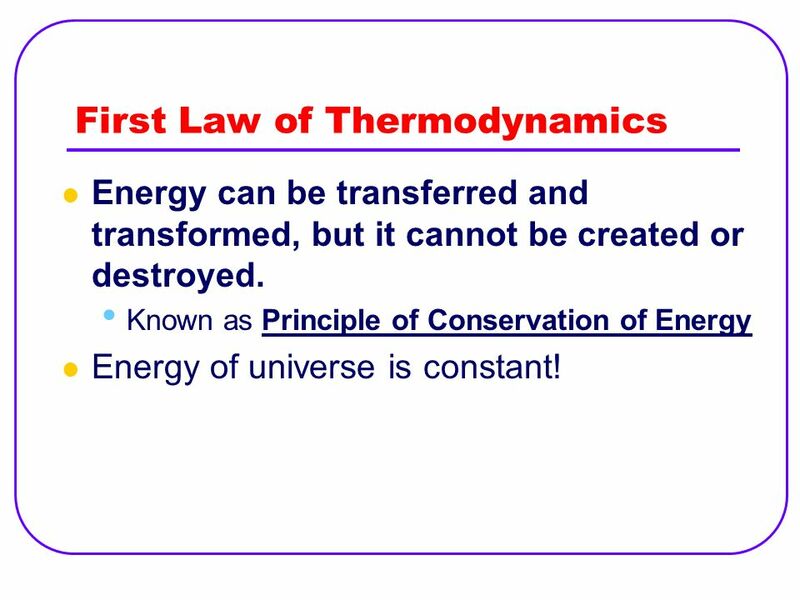 Known as Principle of Conservation of Energy Energy of universe is constant! 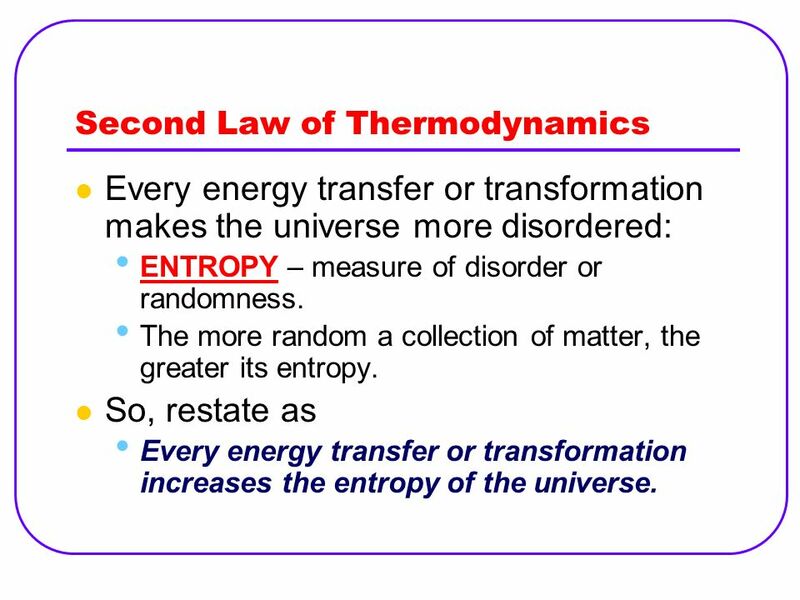 Every energy transfer or transformation makes the universe more disordered: ENTROPY – measure of disorder or randomness. The more random a collection of matter, the greater its entropy. So, restate as Every energy transfer or transformation increases the entropy of the universe. 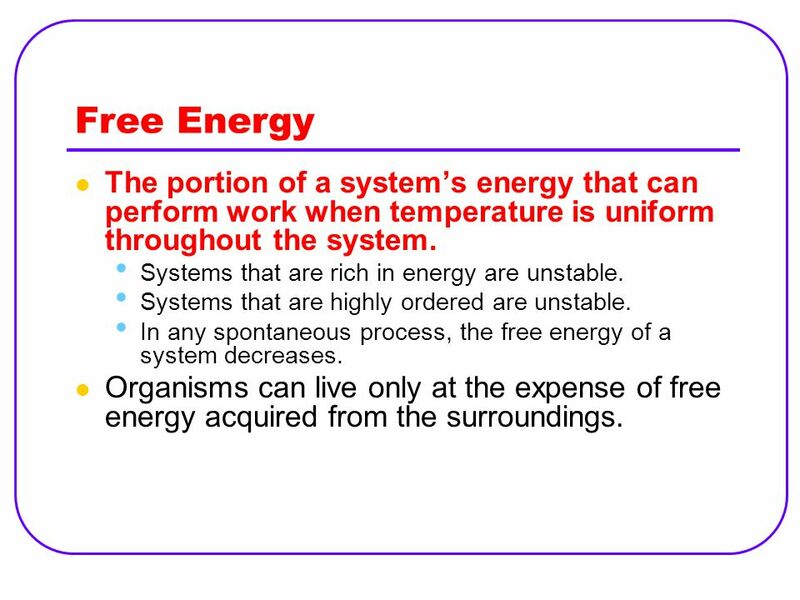 13 Free Energy The portion of a system’s energy that can perform work when temperature is uniform throughout the system. Systems that are rich in energy are unstable. Systems that are highly ordered are unstable. In any spontaneous process, the free energy of a system decreases. Organisms can live only at the expense of free energy acquired from the surroundings. Called “free” energy because it is available for work…NOT because it can be spent without cost to the universe. 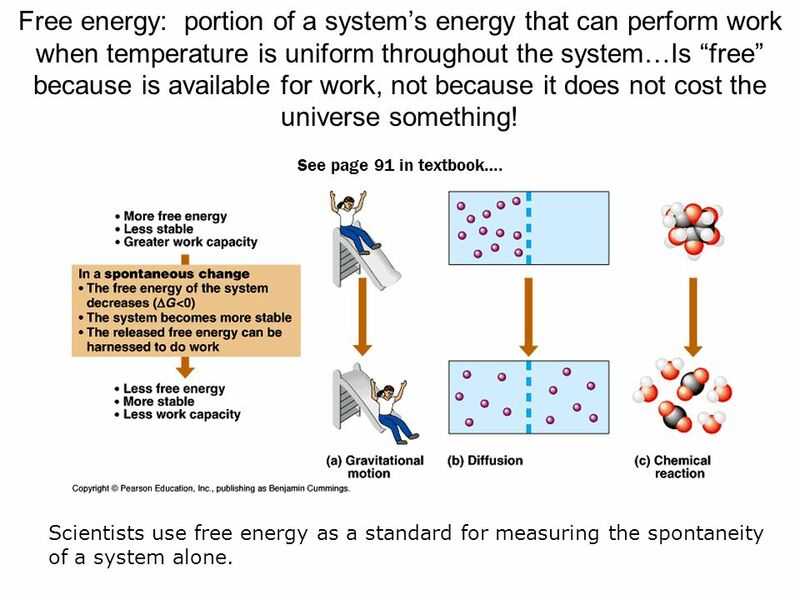 14 Free energy: portion of a system’s energy that can perform work when temperature is uniform throughout the system…Is “free” because is available for work, not because it does not cost the universe something! See page 91 in textbook…. 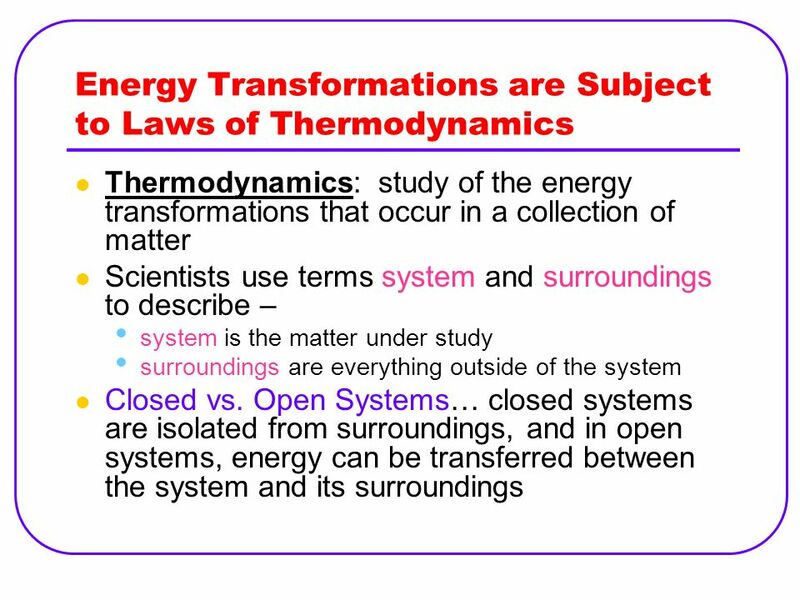 Unstable systems (top diagrams) are rich in “free” energy. They have a tendency to change spontaneously to a more stable state (bottom)…and it is possible to harness this “downhill” change to perform work. Scientists use free energy as a standard for measuring the spontaneity of a system alone. 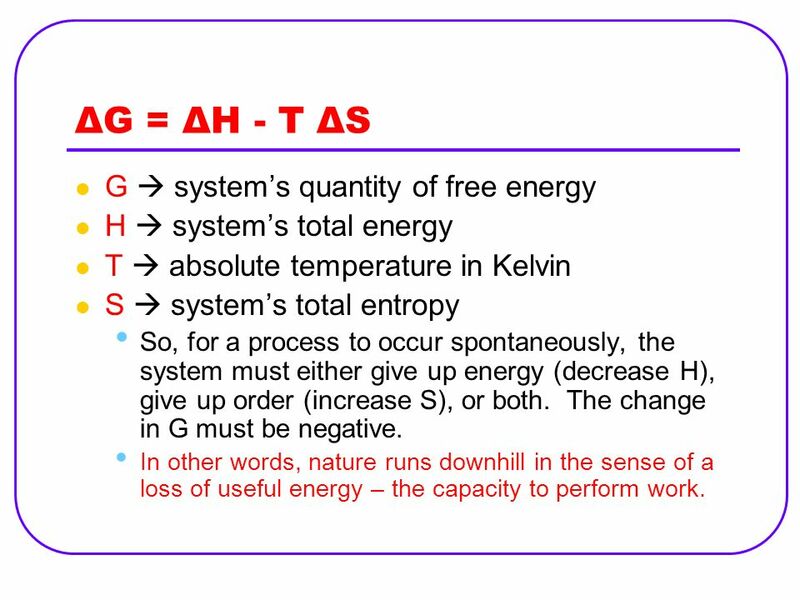 H  system’s total energy T  absolute temperature in Kelvin S  system’s total entropy So, for a process to occur spontaneously, the system must either give up energy (decrease H), give up order (increase S), or both. The change in G must be negative. In other words, nature runs downhill in the sense of a loss of useful energy – the capacity to perform work. A system’s quantity of free energy is symbolized by the letter G. Two components to G – system’s total energy (H) and its entropy (S). 16 Equilibrium State of maximum stability. In chemical reactions, as the reaction proceeds toward equilibrium, the free energy of the mixture of reactants and products decreases. 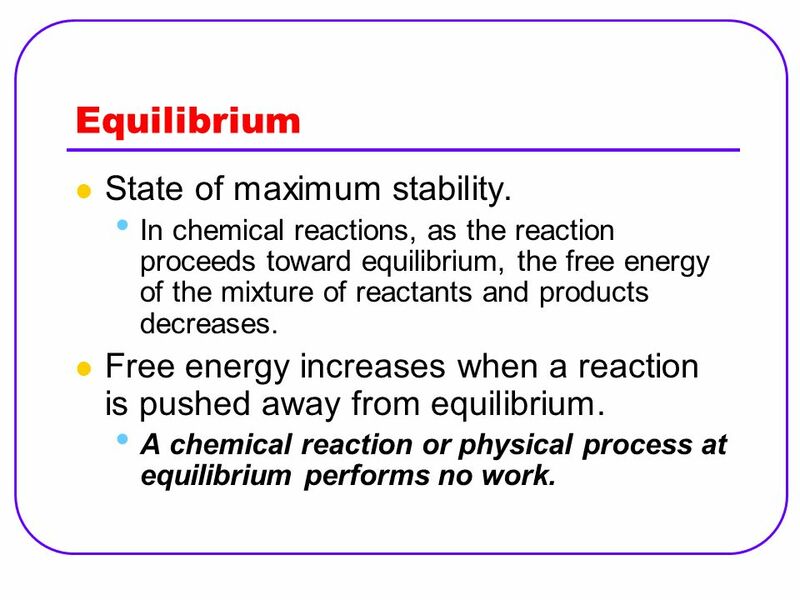 Free energy increases when a reaction is pushed away from equilibrium. A chemical reaction or physical process at equilibrium performs no work. 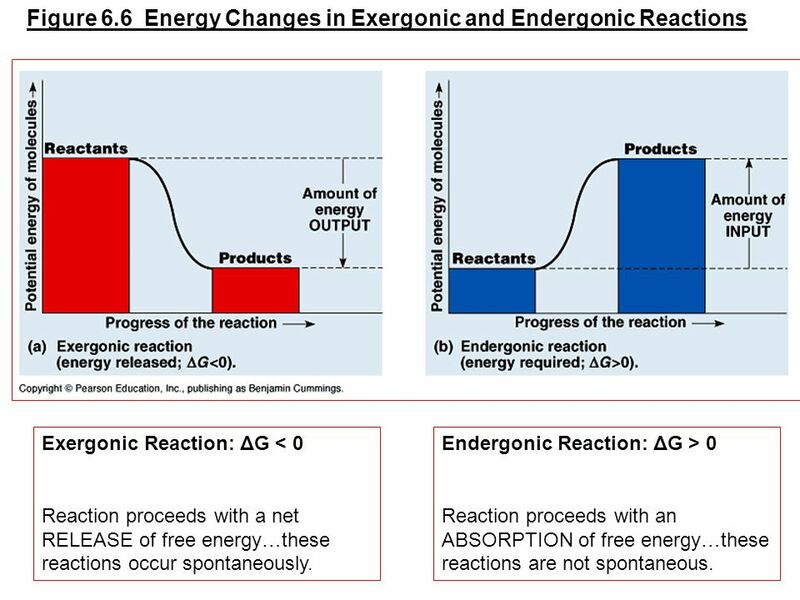 Exergonic Reaction: ΔG < 0 Reaction proceeds with a net RELEASE of free energy…these reactions occur spontaneously. Endergonic Reaction: ΔG > 0 Reaction proceeds with an ABSORPTION of free energy…these reactions are not spontaneous. Reactions in a closed system eventually reach equilibrium and can do no work. 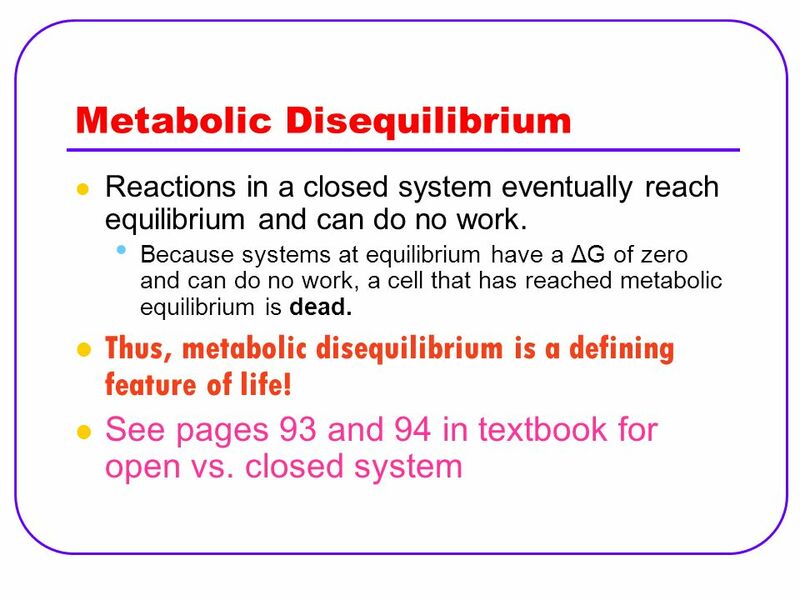 Because systems at equilibrium have a ΔG of zero and can do no work, a cell that has reached metabolic equilibrium is dead. Thus, metabolic disequilibrium is a defining feature of life! 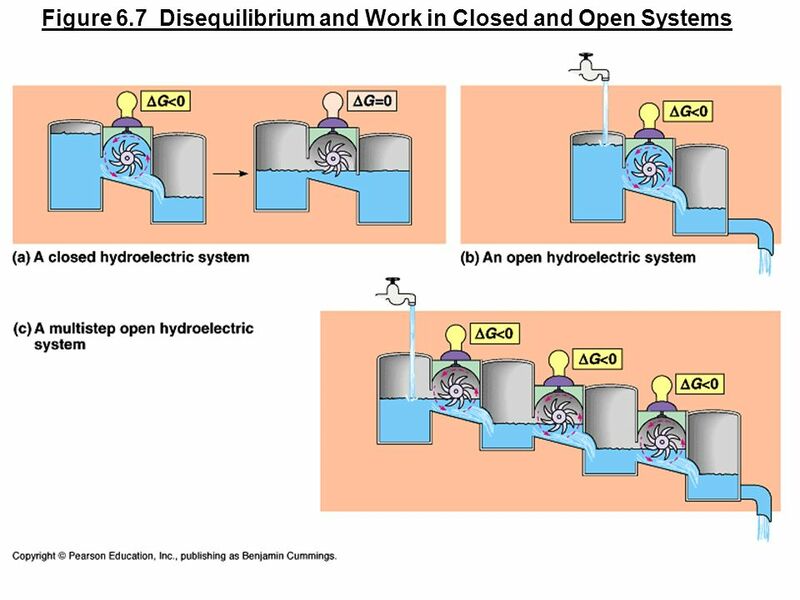 See pages 93 and 94 in textbook for open vs. closed system A cell can maintain metabolic disequilibrium b/c it is an open system – the constant flow of materials in and out of the cell keeps the metabolic pathways from ever reaching equilibrium – and the cell continues to work throughout its life. Flowing water drives the generator only until the system reaches equilibrium (CLOSED) Flowing water keeps driving the generator because intake and outflow of water keep the system from reaching equilibrium (OPEN) Cellular respiration is analogouos to part c. Glucose is broken down in a series of exergonic reactions that power the work of the cell. The product of each reaction becomes the reactant for the next, so no reaction ever reaches equilibrium. 3 kinds of work in cell: 1. mechanical 2. transport 3. chemical Energy Coupling: use of an exergonic process to drive and endergonic process. 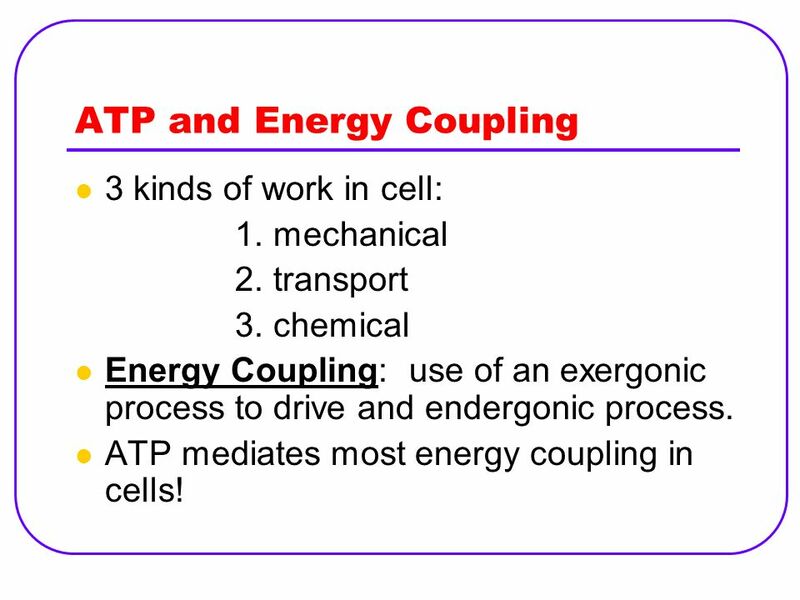 ATP mediates most energy coupling in cells! All are negatively charged – crowded and repel, creating instability! 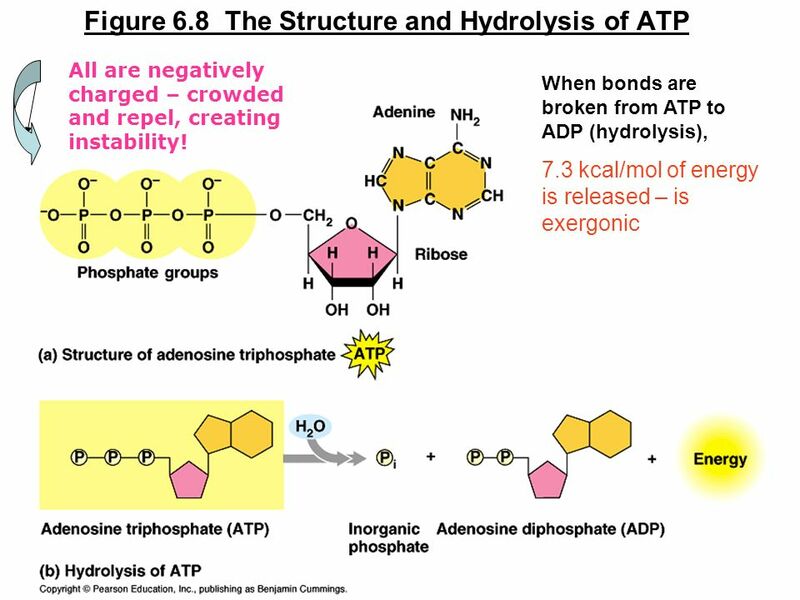 When bonds are broken from ATP to ADP (hydrolysis), 7.3 kcal/mol of energy is released – is exergonic REMEMBER: hydrolysis is a chemical process that splits molecules by the addition of water. The hydrolysis (splitting) of an ATP molecule yields inorganic phosphate and ADP. In the cell, most hydroxyl groups of phosphates are ionized (negatively charged). 23 Phosphorylation Recipient of phosphate group when ATP loses it. This phosphorylated intermediate is more reactive (less stable) than the original molecule. 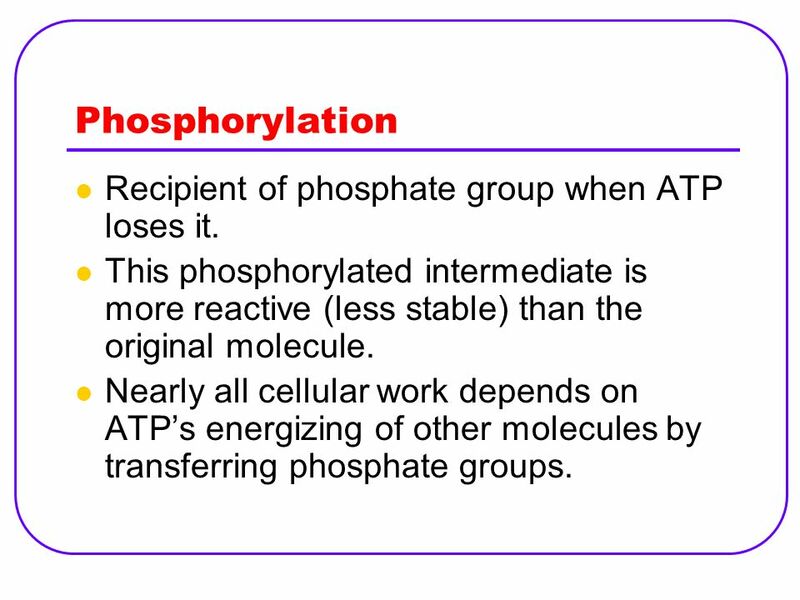 Nearly all cellular work depends on ATP’s energizing of other molecules by transferring phosphate groups. 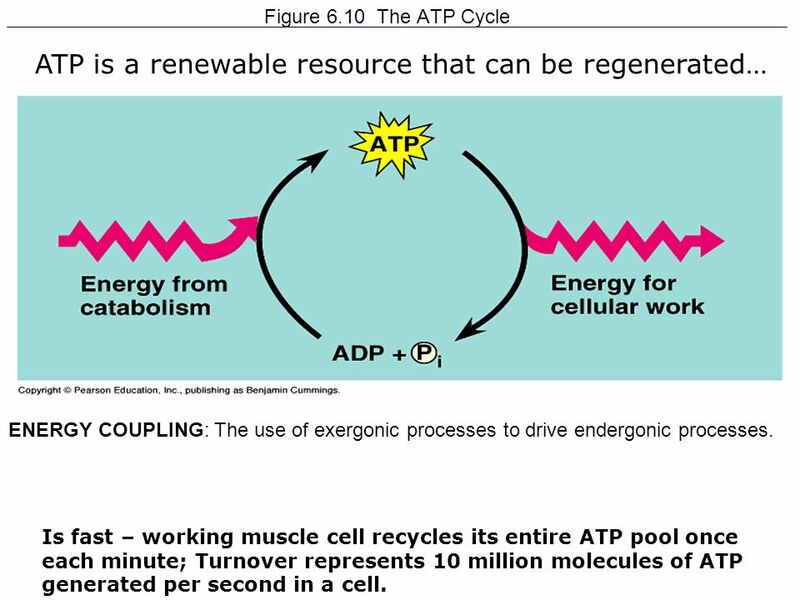 Figure The ATP Cycle ATP is a renewable resource that can be regenerated… Energy released by breakdown reactions (catabolism) in the cell is used to phosphorylate ADP, regenerating ATP. Energy stored as ATP drives most cellular work. Thus, ATP couples the cell’s energy-yielding processes to the energy-consuming ones. ENERGY COUPLING: The use of exergonic processes to drive endergonic processes. Is fast – working muscle cell recycles its entire ATP pool once each minute; Turnover represents 10 million molecules of ATP generated per second in a cell. 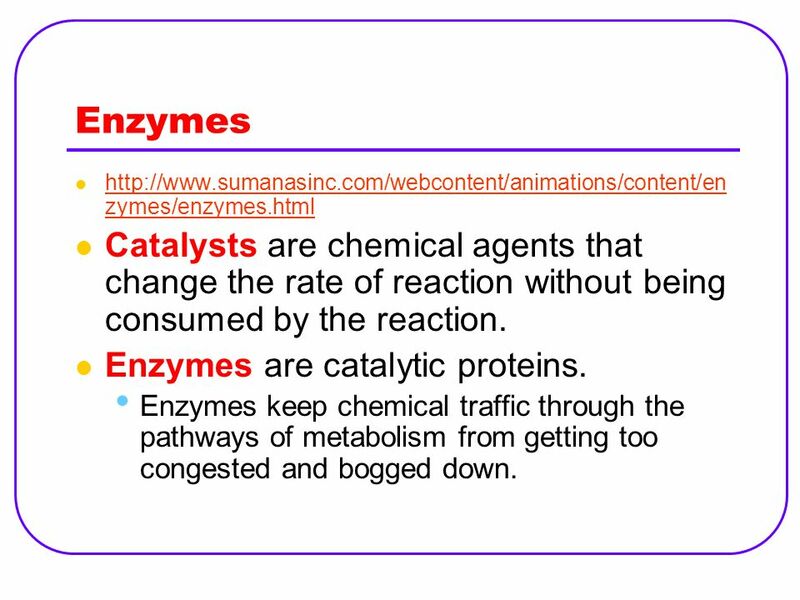 25 Enzymes Catalysts are chemical agents that change the rate of reaction without being consumed by the reaction. 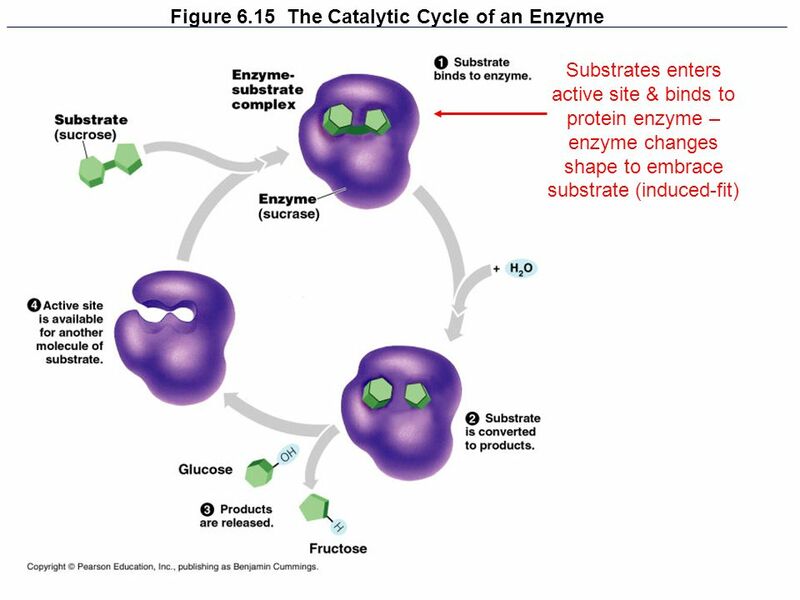 Enzymes are catalytic proteins. Enzymes keep chemical traffic through the pathways of metabolism from getting too congested and bogged down. 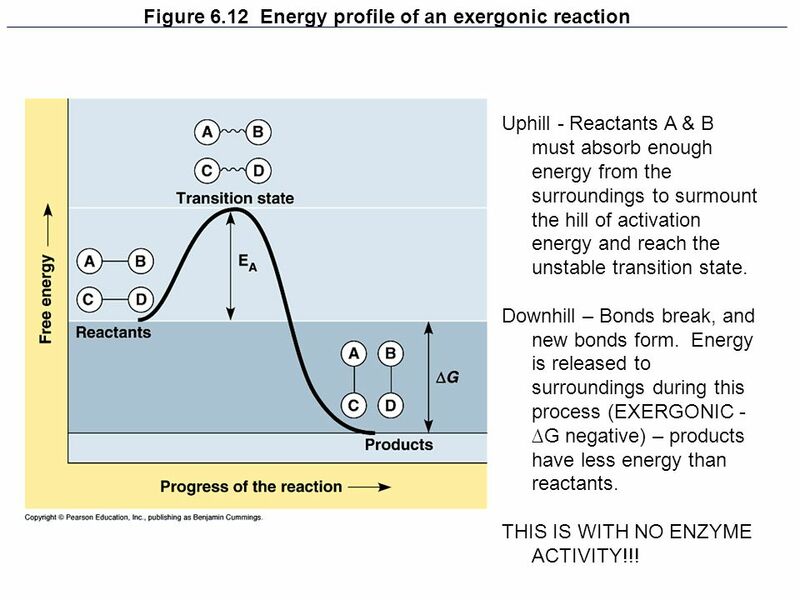 Uphill - Reactants A & B must absorb enough energy from the surroundings to surmount the hill of activation energy and reach the unstable transition state. Downhill – Bonds break, and new bonds form. 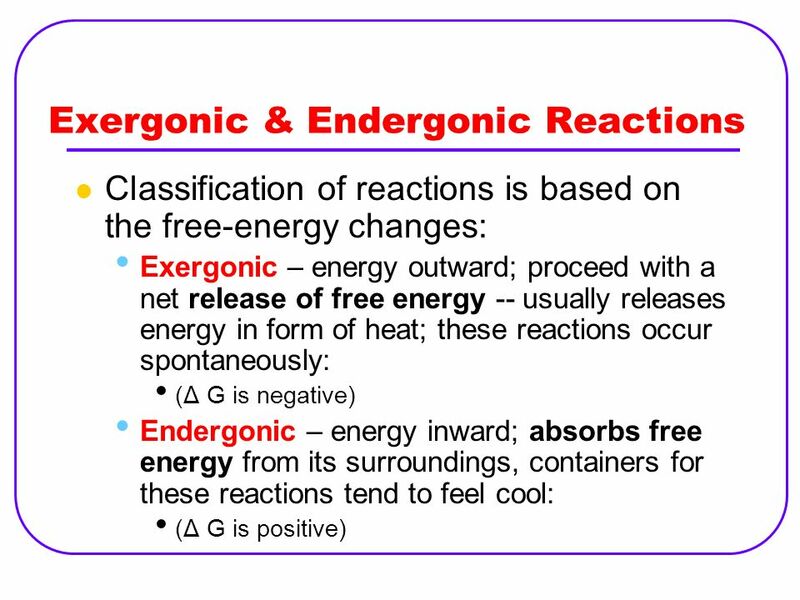 Energy is released to surroundings during this process (EXERGONIC - ∆G negative) – products have less energy than reactants. THIS IS WITH NO ENZYME ACTIVITY!!! 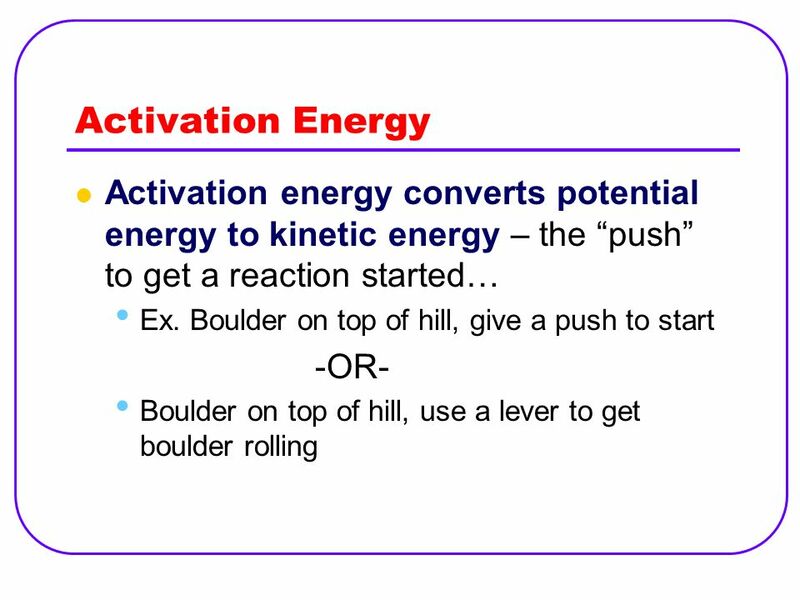 Uphill - Reactants A & B must absorb enough energy from the surroundings to surmount the hill of activation energy and reach the unstable transition state. Downhill – Bonds break, and new bonds form. Energy is released to surroundings during this process (EXERGONIC - ∆G negative) – products have less energy than reactants. THIS IS WITH NO ENZYME ACTIVITY!!! Without affecting the free-energy change (∆G) for the reaction, an enzyme speeds the reaction up by lowering the activation energy required to start the reaction. 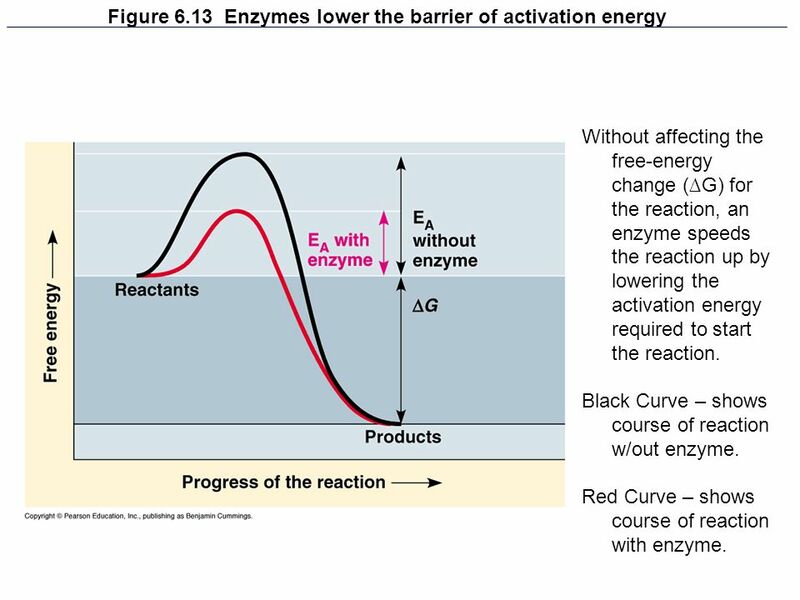 Black Curve – shows course of reaction w/out enzyme. Red Curve – shows course of reaction with enzyme. Without affecting the free-energy change (∆G) for the reaction, an enzyme speeds the reaction up by lowering the activation energy required to start the reaction. Black Curve – shows course of reaction w/out enzyme. Red Curve – shows course of reaction with enzyme. 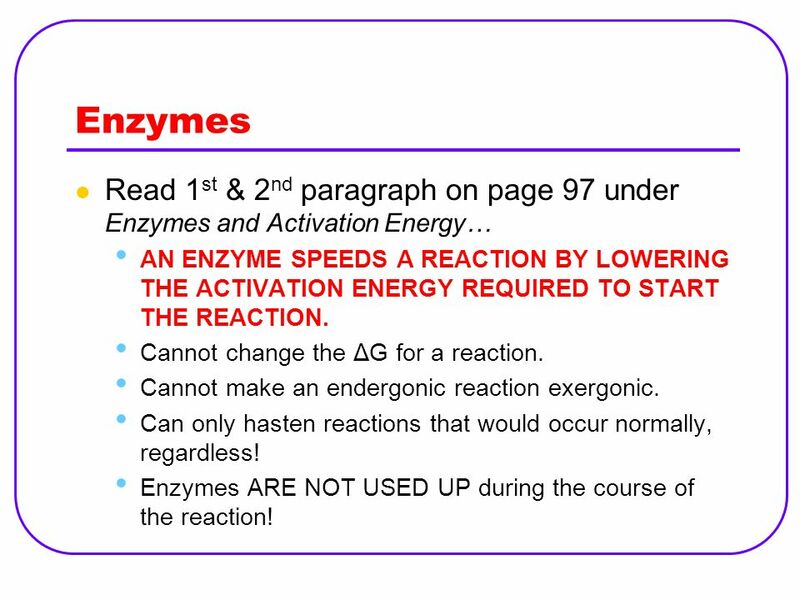 29 Enzymes Read 1st & 2nd paragraph on page 97 under Enzymes and Activation Energy… AN ENZYME SPEEDS A REACTION BY LOWERING THE ACTIVATION ENERGY REQUIRED TO START THE REACTION. Cannot change the ΔG for a reaction. Cannot make an endergonic reaction exergonic. Can only hasten reactions that would occur normally, regardless! 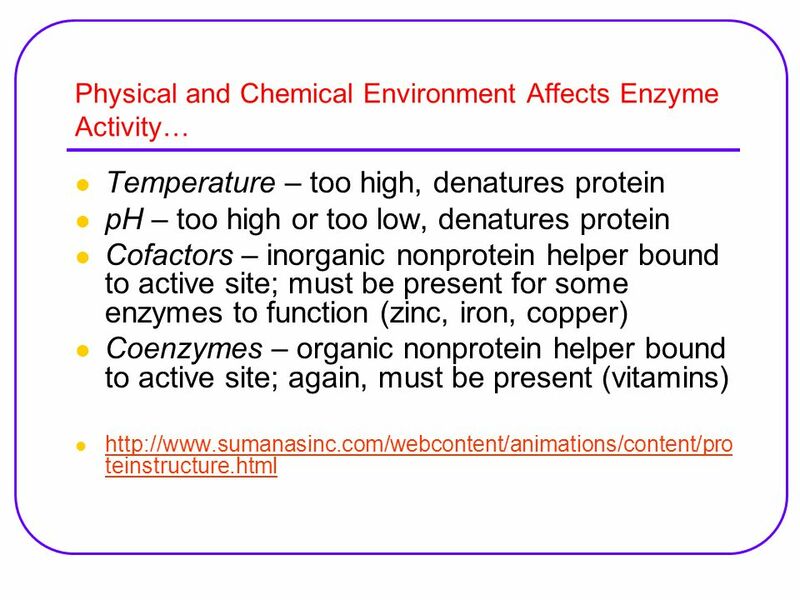 Enzymes ARE NOT USED UP during the course of the reaction! 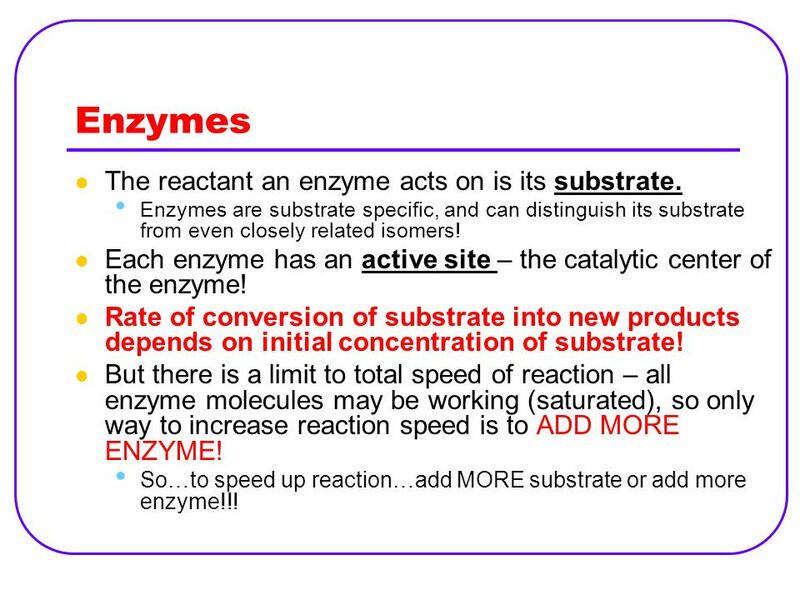 30 Enzymes The reactant an enzyme acts on is its substrate. Enzymes are substrate specific, and can distinguish its substrate from even closely related isomers! Each enzyme has an active site – the catalytic center of the enzyme! Rate of conversion of substrate into new products depends on initial concentration of substrate! But there is a limit to total speed of reaction – all enzyme molecules may be working (saturated), so only way to increase reaction speed is to ADD MORE ENZYME! So…to speed up reaction…add MORE substrate or add more enzyme!!! The specificity of an enzyme is attributed to a compatible fit between the shape of its active site and the shape of the substrate. Active site of enzyme can be seen in computer model as groove on surface of protein (blue) On entering the active site, the substrate (red) induces a change in the shape of the protein that causes the active site to embrace the substrate. The specificity of an enzyme is attributed to a compatible fit between the shape of its active site and the shape of the substrate. 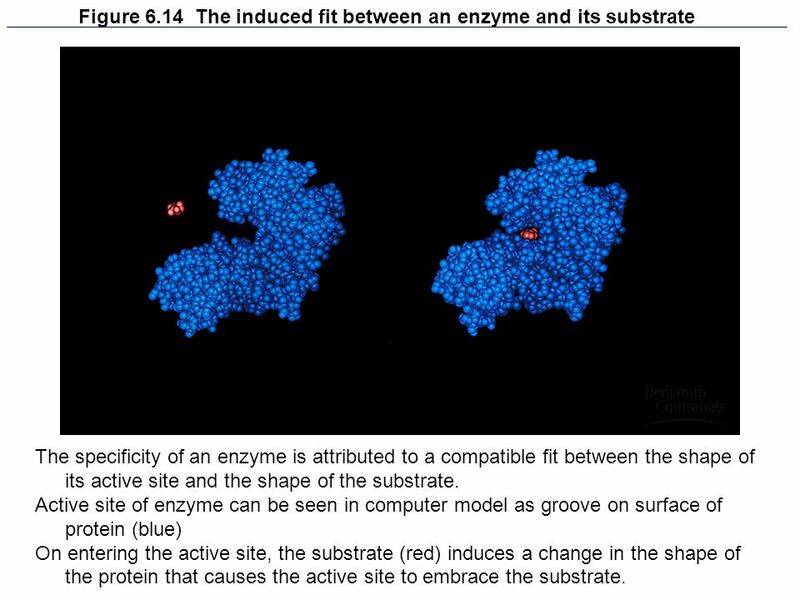 Active site of enzyme can be seen in computer model as groove on surface of protein (blue) On entering the active site, the substrate (red) induces a change in the shape of the protein that causes the active site to embrace the substrate. 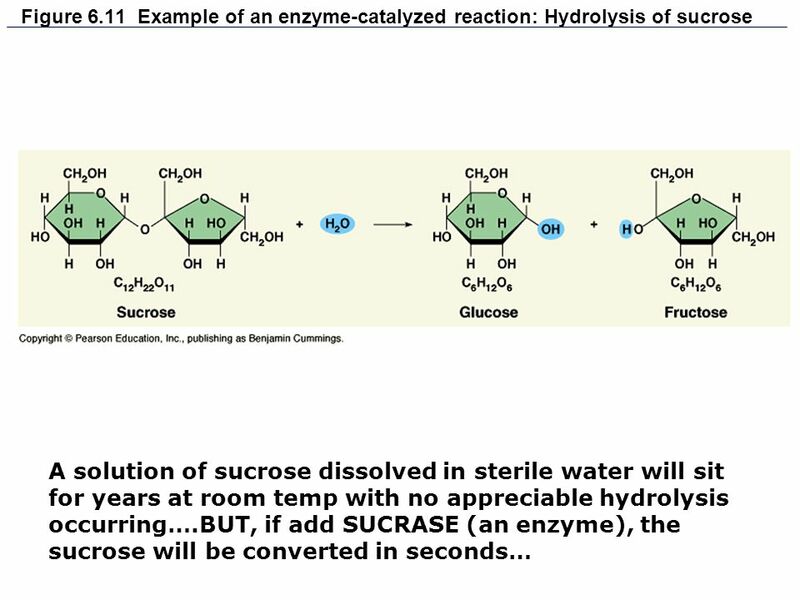 Substrates enters active site & binds to protein enzyme – enzyme changes shape to embrace substrate (induced-fit) In this example, the enzyme sucrase catalyzes the hydrolysis of sucrose to glucose and fructose. 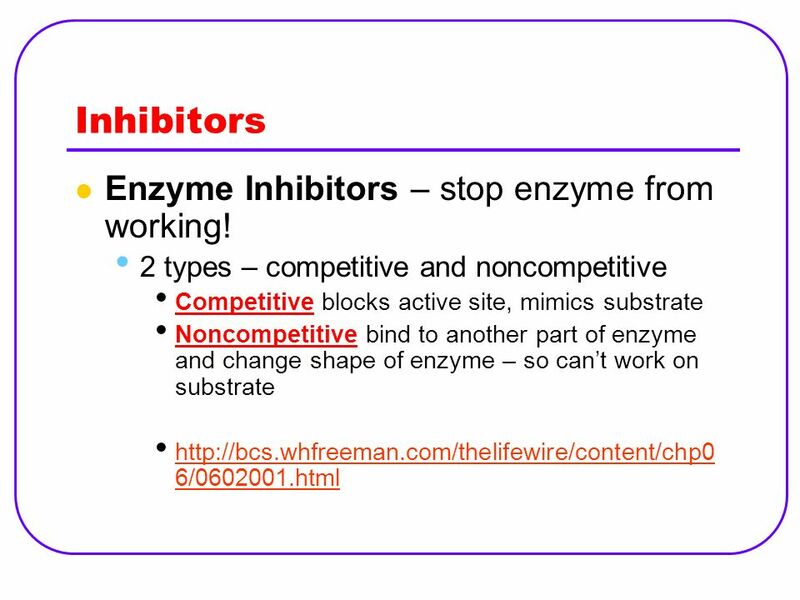 34 Inhibitors Enzyme Inhibitors – stop enzyme from working! Mimics the substrate and competes for the active site. Some poisons absorbed from environment act as inhibitors. Many antibiotics are inhibitors of specific enzymes in bacteria. NOT ALL inhibitors are bad – body’s selective inhibition is good! 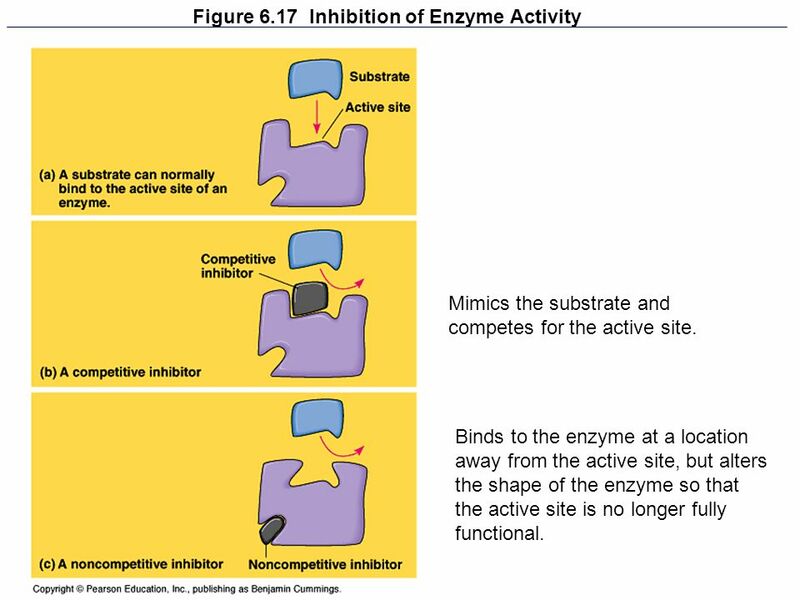 Binds to the enzyme at a location away from the active site, but alters the shape of the enzyme so that the active site is no longer fully functional. *By binding to allosteric site, can either inhibit or stimulate *Most allosterically regulated enzymes are made up of one or more polypeptide subunits – each having its own active site. 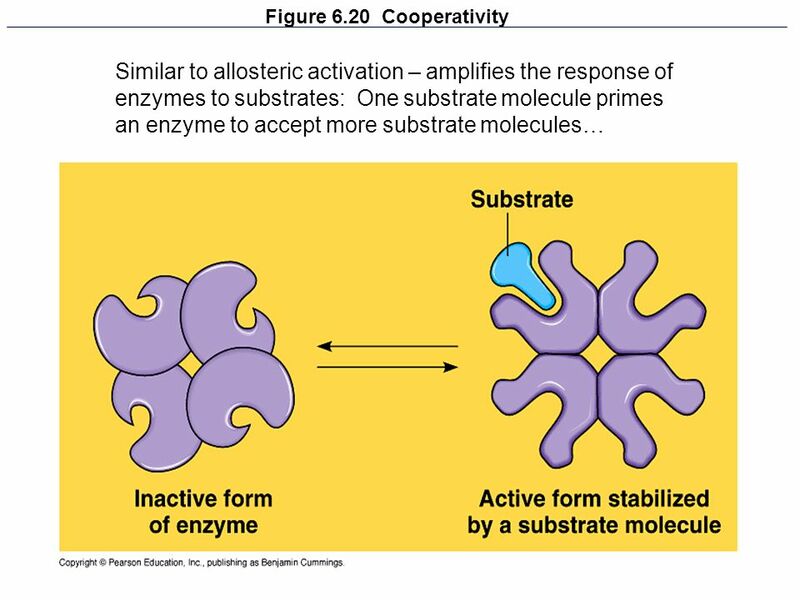 MOST ALLOSTERICALLY REGULATED ENZYMES ARE CONSTRUCTED FROM 2 OR MORE POLYPEPTIDE CHAINS: The enzyme oscillates between 2 conformational states, one active and the other inactive. 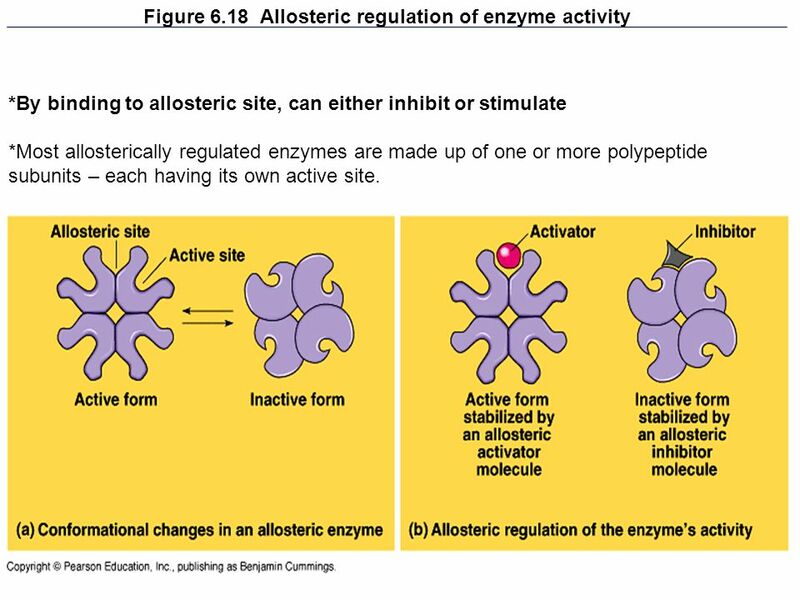 Remote (away) from the active sites are the allosteric sites, specific receptors for regulators of the enzyme, which may be an activator or an inhibitor. b) Here we see the opposing affects of an allosteric activator and an allosteric inhibitor on the conformation of all four subunits of enzyme. 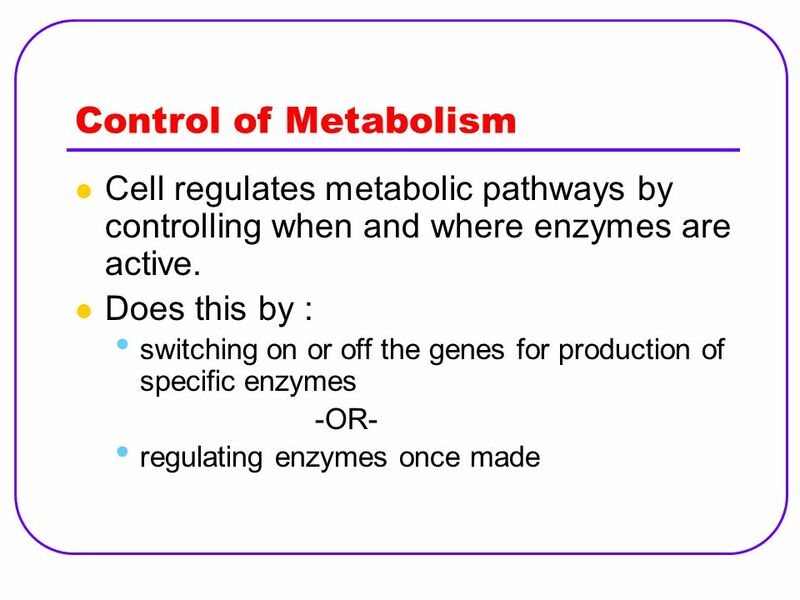 Switching off of a metabolic pathway by its end product, which acts an inhibitor of an enzyme within the pathway. Many metabolic pathways are switched off by an end product, which acts as an allosteric inhibitor of an enzyme earlier in the pathway. 39 Figure Cooperativity Similar to allosteric activation – amplifies the response of enzymes to substrates: One substrate molecule primes an enzyme to accept more substrate molecules… In an enzyme molecule with multiple subunits, the binding of one substrate molecule to the active site of one subunit causes all the subunits to assume their active conformation. 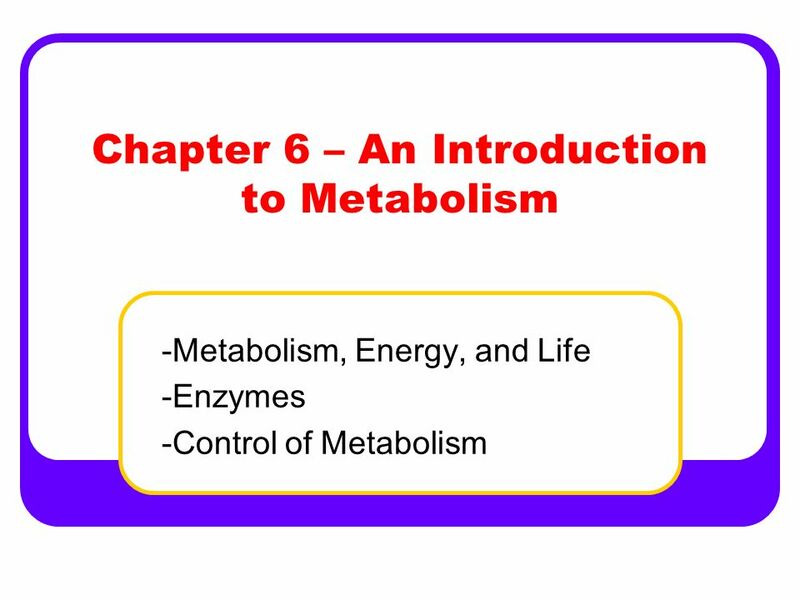 Download ppt "Chapter 6 – An Introduction to Metabolism"
Introduction to Metabolism Chapter 6. 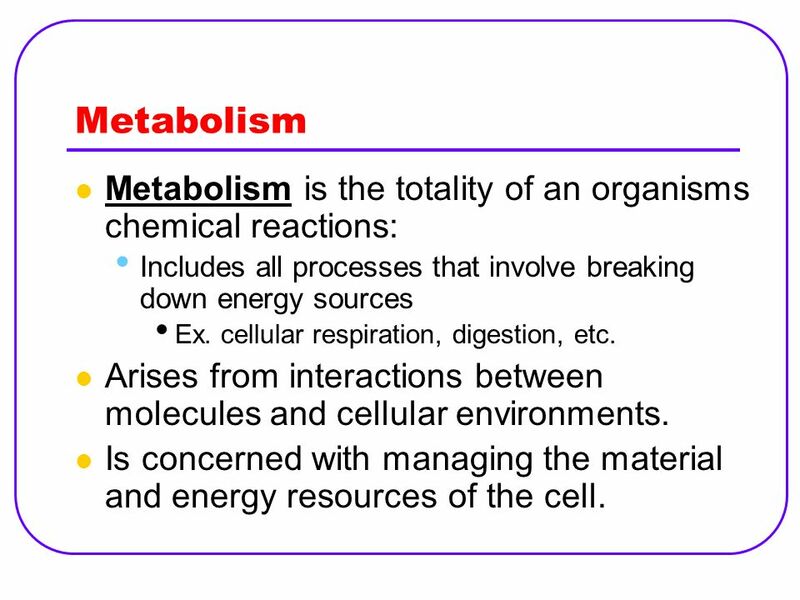 Metabolism - sum of organism’s chemical processes. Enzymes start processes. 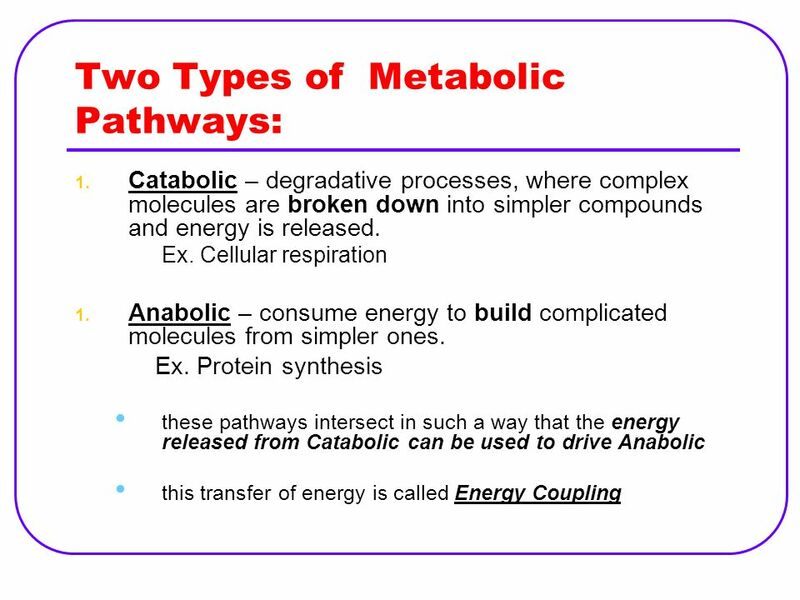 Catabolic pathways release energy (breaks. 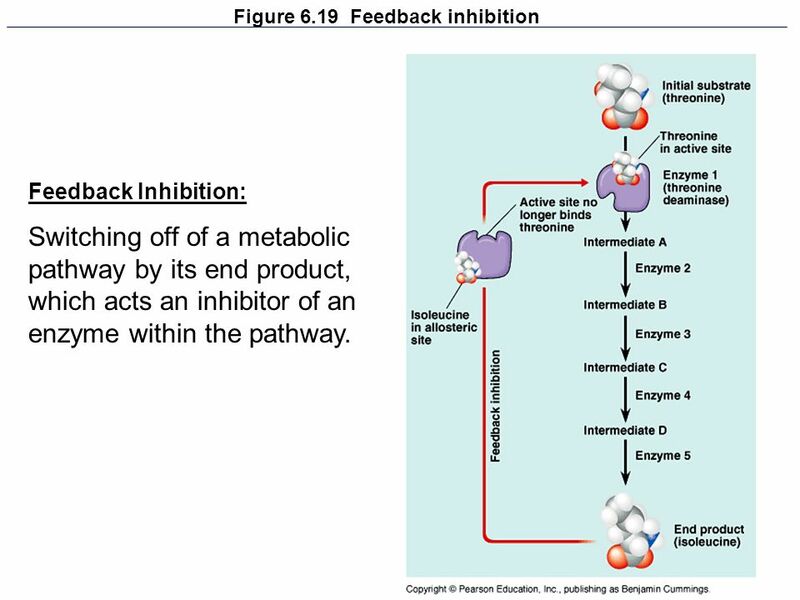 CHAPTER 8 AN INTRODUCTION TO METABOLISM The totality of an organism’s chemical reactions is called _______________. A cell’s ______________ is an elaborate. Chapter 6 An Introduction To Metabolism. Metabolism/Bioenergetics Metabolism: The totality of an organism’s chemical processes; managing the material. Chapter 8~ An Introduction to Metabolism. Metabolism Metabolism Metabolism: The totality of an organism’s chemical processes; managing the material and. Chapter 8 An Introduction To Metabolism. Metabolism u The totality of an organism’s chemical processes. u Concerned with managing the material and energy. Metabolism and Energy Chapters 8.  2.a.1 – All living systems require constant input of free energy ( ).  4.b.1 – Interactions between molecules affect their structure and function. 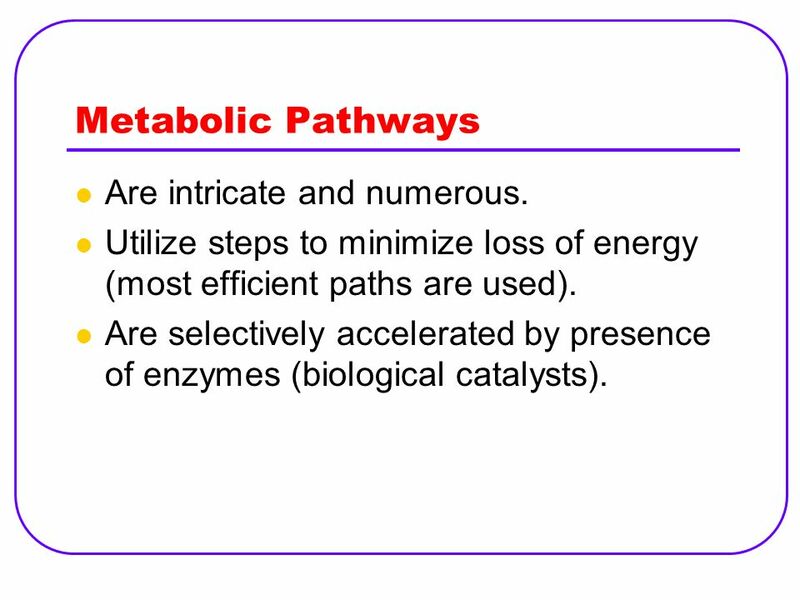 An Introduction to Metabolism Bioenergetics Enzymes.